The Samsung Galaxy S4 and the HTC One take a very different approach to photography. The One tries to be different with a special sensor with big pixels and a dedicated image processing chip, while the Galaxy S4 sticks to the traditional formula of a high-res camera and mature software processing. Before we talk camera features though, we should cover the camera interfaces. The Samsung Galaxy S4 camera interface builds on the Galaxy Camera UI. Its most advanced features are available on a carousel with descriptive images and text and once you're used to them you can switch to a grid, so each shooting mode is only a couple of taps away. Color effects are hidden at the bottom of the screen and they all get a simultaneous live preview to help you choose. Additional settings are available in the upper left, though you'd rarely use those. We're not very happy about Samsung unifying the still and video camera UIs though - if you're shooting 4:3 photos (which you should if you want the full 13MP resolution), you have to frame your videos on a 4:3 viewfinder that expands to 16:9 only after you hit record. The HTC One camera interface relies on a single long list of menu items and sub items to select scenes and modes and settings for both stills and videos. It's not nearly as streamlined and you'll have to scroll to find the option you're looking for. But HTC is banking on the Zoe feature set, which does get a dedicated button and so do color effects. The camera has a unified interface for stills and videos too, but since the sensor itself has a 16:9 aspect ratio it's not a problem really. One cool thing about the Galaxy S4 UI is that it allows you to set the role of the volume rocker - it can be a still camera shutter key, video camera shutter key or zoom lever. Both the Galaxy S4 and the One skip the lockscreen when you hit the Power/Lock key (or Home key on the S4) if the currently running app is the camera, which is great for shooting sprees. Both cameras have a long list of features with the Galaxy S4 having more, while the One is tidier as most features are concentrated into Zoe. The Galaxy S4 has a number of useful shooting modes - there's HDR, of course, panorama and 360 photo (Photo Sphere), plus object removal, cinemagrams and Sound & shot (still image plus background audio from the scene). The dual-shot mode is pretty sweet as it solves the problem of who gets left out of the group photo (or video). The HTC One doesn't have an answer to 360 photo or dual-shot but it does have its advantages. The Zoe Highlights for one are pretty awesome and give you much more than the combination of cinemagrams and Sound & shot can. Plus, with Zoe you don't have to choose - you can get the animation, the sound, do object removal, do Sequence shot (which Samsung calls Drama shot) and so on, while with the Galaxy S4 these modes are separate and you have to choose which one you want while capturing the image. You can't go back and edit it like you can with Zoe. Another advantage of Zoe is that it's fairly easy to share - you get your still photo and the 3 second video that was recorded as separate files and you can upload the Highlight to Zoe Share and sent the link to your friends. The site relies on Flash though, so viewing it on a mobile device might be problematic. Also, each Zoe shot takes 3 seconds if you want usable video. With the Galaxy S4 you can have a low-quality GIF (only if you shot in Cine photo mode) rather than a 1080p video, you can't really share Sound & shot photos (only the static image gets sent, the audio is dropped). The HTC One isn't done - it has Optical Image Stabilization (OIS), which combined with its big "UltraPixels" should translate to better low-light performance. We'll test that later on. OIS also means smoother video, here's how the One stabilization stacks up against the Galaxy S4's digital image stabilization. Another thing to mention here is the camera speed - for regular shots both phones are blazing fast. However, the Samsung Galaxy S4 takes longer when doing special shots like HDR or Night Mode compared to the HTC One. Winner: HTC One. 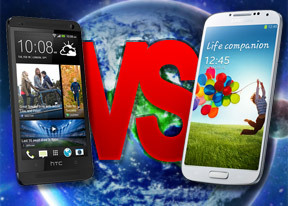 Both phones have a lot going for them, but we're willing to rule in favor of the HTC One. It makes it very easy to make a cool collection of shots with Zoe and Highlights, with easy editing after the shot and easy sharing. It's also faster when taking pictures, especially when in a special mode. And the OIS is awesome to have no matter what. The Samsung Galaxy S4 does win out on a sheer number of features and we like the simplicity of the carousel interface. Ywt most people will be shooting in auto mode and might not even see all these features.